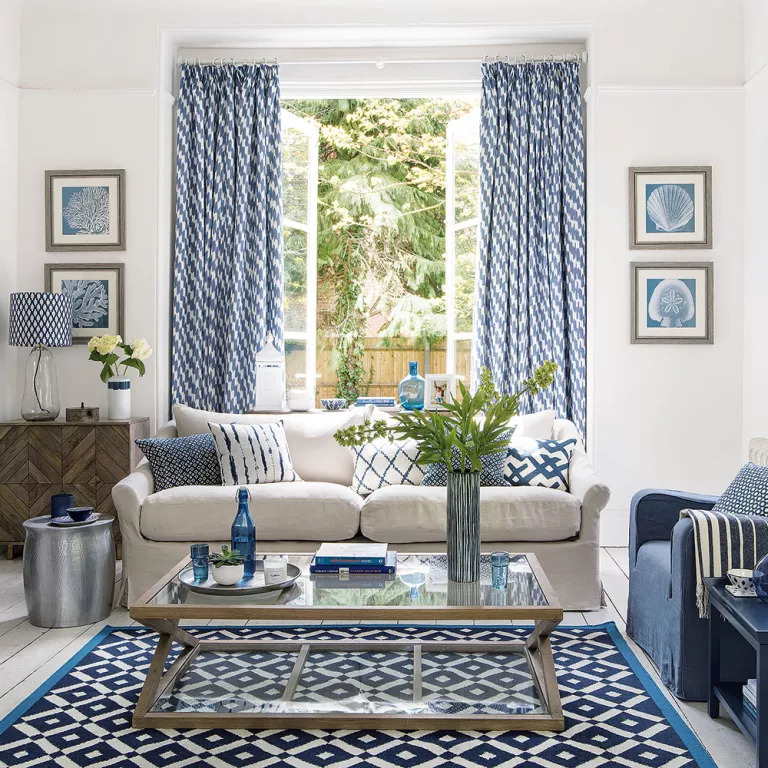 Our blue living room ideas are some of our favourites, simply because blue is such a versatile hue to work with. At one minute exciting and decadent, the next restful and easy to live with, blue can be anything you want it to be depending on the shade that you choose. Smart and sophisticated, navy and teal blues are the warmer way of embracing on-trend dark hues. They also have a luxurious feel – and for very good reason. 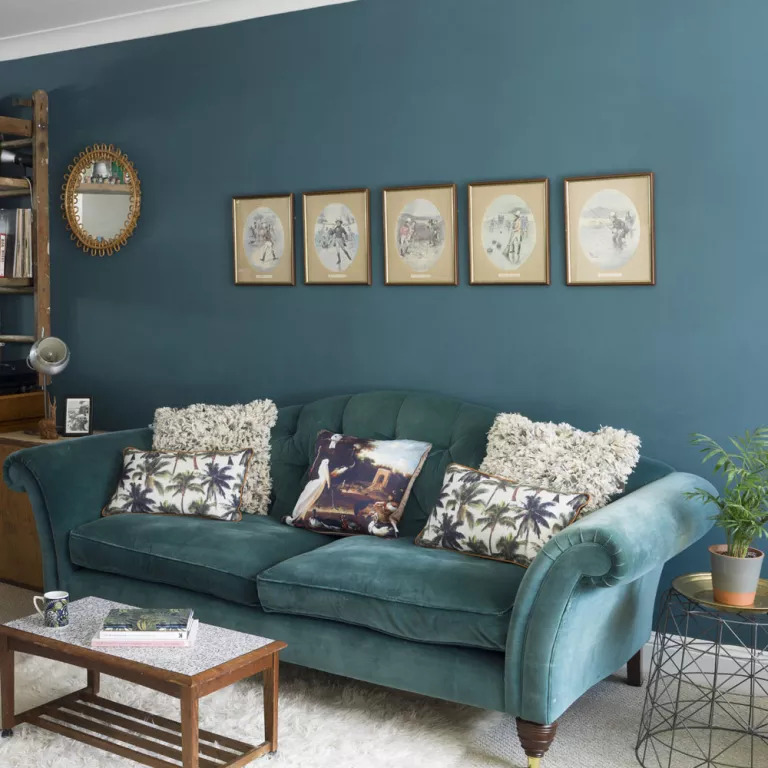 ‘Historically, blue was a colour that was one of the most expensive to produce and spoke of the wealth and extravagance of the homes it appeared in,’ explains David Mottershead, managing director of Little Greene. By contrast, sea blues and duck egg blues are all calm and serenity, making them the perfect antidote to our 24/7 lives. You don’t need a home by the sea to enjoy them, though they do work best with simple Shaker and country style furniture in whites and very pale timbers. Read on to find the hue of blue that’s perfect for you. You might think of blue as a cool colour, but the deepest, darkest shades will create a cosy, cocooning look, as evidenced here. Greys and blush pinks are the ideal bedfellows – or should that be sofa fellows? – for this opulent midnight shade. They both soften and brighten up the room, while a woodturning stove, tongue and groove panelling and pale wood furniture enhance the rustic feel. There’s a fine line between traditional and tired, but it can be completely avoided if you are confident with colour. This strong teal brings a certain amount of heritage to this living room, but it simultaneously feels fresh. Matching the sofa and the walls emboldens the look and creates a strong backdrop where it’s possible to mix up antiques with modern pieces without the overall effect being messy. 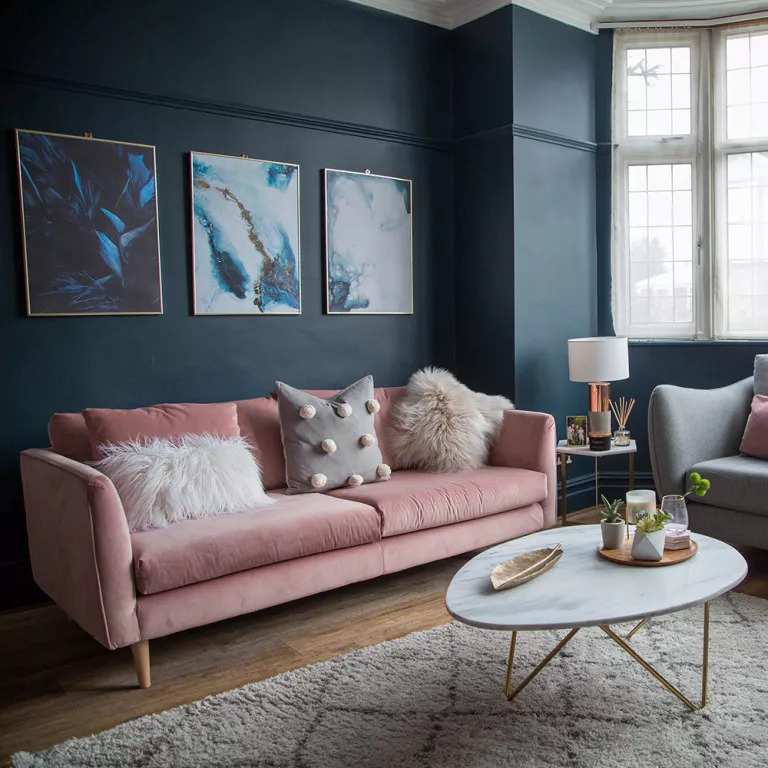 Backed by any other shade, this pink sofa might look a little too sugary for many people’s taste. But with a dark inky blue behind it, it’s the ultimate in sophistication, enhanced by the coffee table’s brass legs and accessories. Also framed in brass are three blue prints, which break up the blue without detracting too much from its effect. Warm wood flooring and a pale rug keep things bright yet cosy underfoot. 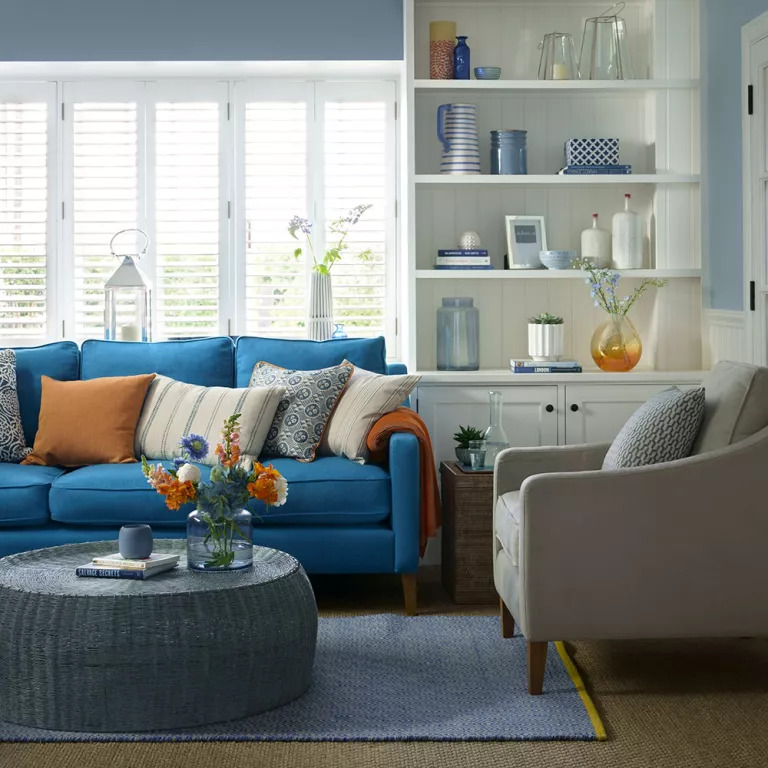 Here, a vibrant turquoise blue sofa pops against a soothing backdrop of denim blue, for our take on modern coastal. Stonewashed blues like these are the perfect foundation for classic styles of furniture, the white dresser being a prime example. It’s a good idea to reflect them in the accessories in display. 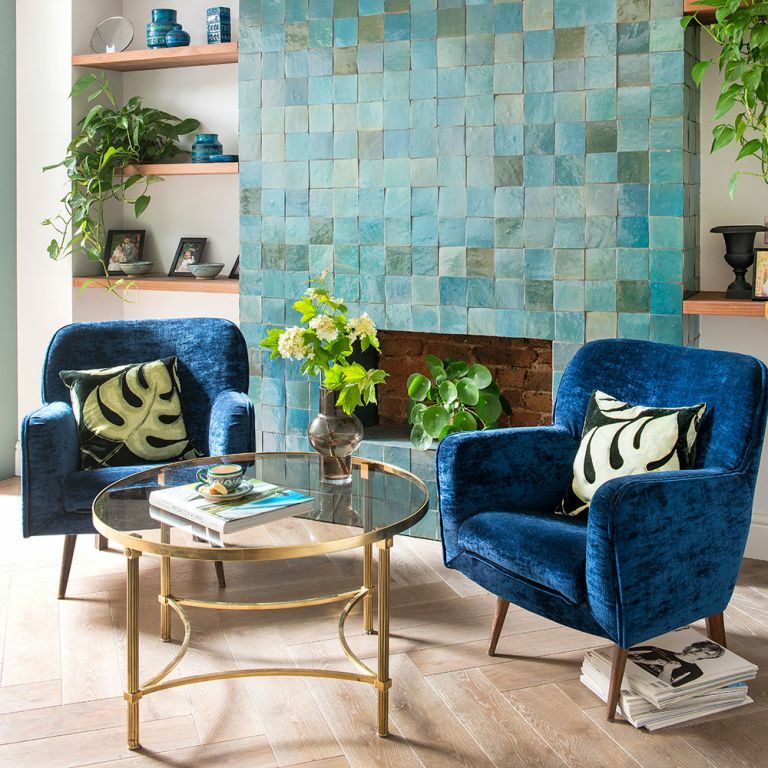 You’ll need to have a healthy budget, but a feature wall formed of cement tiles can look truly spectacular and – despite the rustic nature of their material – glamorous. Velvet chairs in a deeper blue enhance this effect, and again, accessories in a similar turquoise are accents that bring the room together. The golden rules for making this formal look work are to stick to a neutral hue for the walls and floor, and then to keep with a strict palette, which will allow you to play with pattern. No two motifs are the same, yet they work harmoniously with each other and create an eclectic, global-inspired look, rather than a contrived seaside scheme. 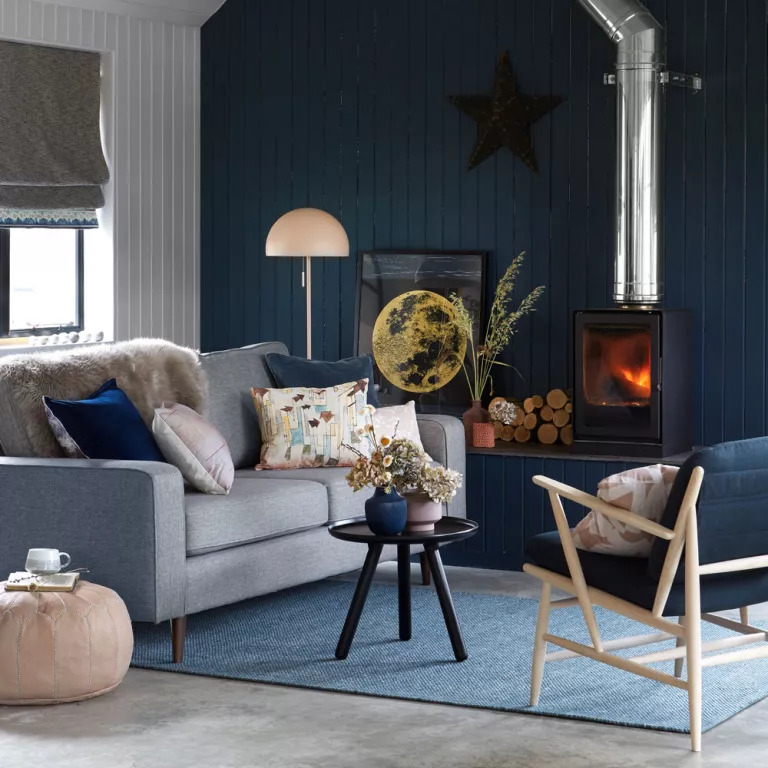 The post Blue living room ideas – from midnight to duck egg, see how sophisticated blue can be appeared first on Ideal Home.